The housing market in East Renfrewshire is becoming continuously more competitive with beautiful homes coming up for sale every day. An easy way to encourage prospective buyers and make sure you achieve the desired price is by refreshing your home décor; we have previously discussed kitchens and bathrooms, today we are looking at quick ways to refresh your living room. The effort you might put in now will pay off as homes which are well decorated stick in the buyers mind and making your home stand out can be what enables the property to sell for the right price quickly. If you are considering refreshing your décor, we suggest you pay attention to your lounge or living area – the space where we spend our evenings as a family, watching TV or chatting, where all the household gathers after a long day at work or school. It is important for any prospective buyer to be able to see themselves quickly adjusting the room to their style, without big effort or spend, so a toned down pleasant atmosphere is a great first step – keep reading to discover how to achieve that quickly. Another simple addition to living room is refreshing the floor. If expensive solid wood flooring is not an option, the addition of a new large rug might be a less pricey choice. A rug can help tie the rooms colour palette together as well as adding a new texture and make it feel more warm and inviting. It is also important to consider the arrangement of the pre-existing furniture. Misplacement of large pieces can make the room feel cramped which will put off any viewer. A rule of thumb is to align the sofa along the widest wall and then balance out the other side of the room with chairs. Perhaps a fresh coat of paint does not sound like much, but it can completely turn around a living room and change the entire room atmosphere. Probably the biggest challenge in redesigning a space is choosing a colour palate and sticking to it while still mixing tones, shapes and textures to create interest. Once you have chosen a colour for the walls you can pick colour accents for your soft furnishings and accessories to bring the room together. A well lit, bright space makes a huge difference in the overall atmosphere and even the perceived warmth of the house. So make sure you add quality bulbs to your existing lights and perhaps add accents of light – a floor lamp or a reading lamp to put the space in the best light even in dark autumn evenings. An easy trick to update and brighten your living room is to add a large wall mirror, making the room seem bigger and brighter. The addition of artwork can also instantly update a living room. Try positioning a painting or large photograph above an item of furniture. This will bring the eyes up and make the ceiling appear higher. When buying art try to go for something that works well within your chosen colour palette that perhaps has a calming quality. With photography, while not a steadfast rule, look for black and white background pieces. The main aim when redesigning any room is balance. 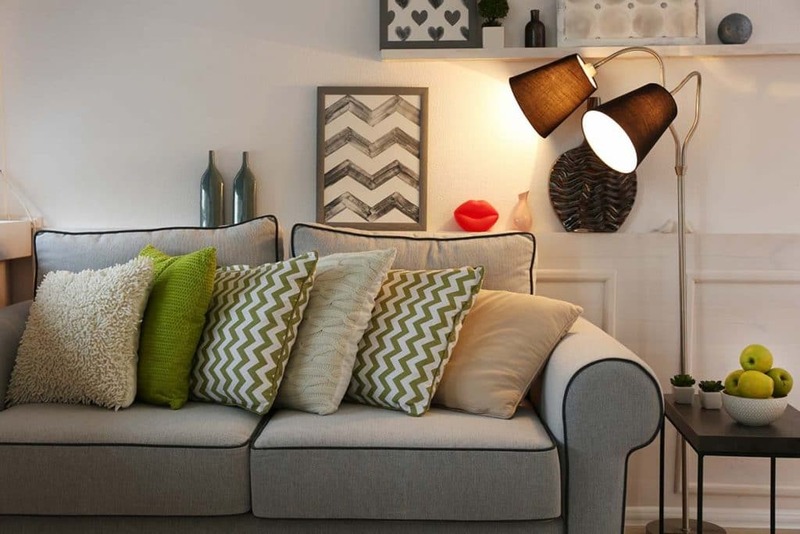 We hope you feel inspired by our guide to refresh your living room and find it useful!